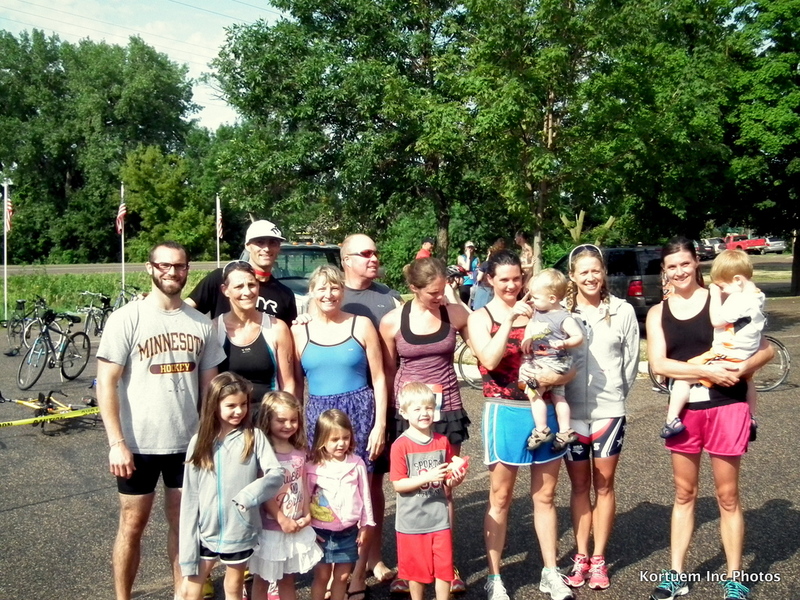 This past Saturday, I raced near downtown Minneapolis out and around Lake Nakomis. Heading into this race, I had three goals aiming to accomplish. First importance was the women’s win, second was the Equalizer win and the third goal lingering in the back of my head was attempting the course record. I am very happy to say I accomplished all three of my goals! However, during the race I was first focused on the women’s win and after the bike segment of the race, solely focused on winning the Equalizer. I did not even think about going after the course record while out on the course, but the race unfolded with Hunter pushing me in the last mile to take the time in 1:57:50. The previous record was set by the 2004 Olympic Silver Medalist from Australia, Loretta Harrop eight years ago with a time of 1:57:58. Loretta was an amazing all round triathlete and I am humbled to have just beaten her record. My race preparations for the race was unexpectedly different than normal and what we had originally planned. Two days after arriving back from the Philadelphia Triathlon at the end of June, the fires in Colorado Springs took a turn for the worst. The destruction was devastating to the area affected and the smoke in the air made training difficult. Nate and I decided to head to Minneapolis two weeks early to avoid training in the smoke and prep for the Lifetime race. Most of Nate’s family lives in Minnesota, so we had plenty of places to stay and train north and south of the city. Our time in Minnesota was a blast! We got to spend the 4th at Lake Elysian with the family. Nate also competed in his first triathlon in four years at the Elysian Tri and took home the course record. I guess that’s two records in one week, so not bad for the Kortuem team! I did the race as an exhibition event and got to start the race with Nate in the men’s wave. It was a blast being able to race Nate, even though we train together nearly every day, racing adds that extra element! I exited the 600 meter swim just in front, put 15 seconds into Nate during the eight bike, but he caught back up to me just after the first mile into the 3.7 mil run. He crossed the tape about 25 seconds in front of me, but as the papers put it, he was nervous about “Getting Spoused”. I had full confidence in his abilities, and knew I would need a bit of an “Equalizer” to beat him. Many of our family members did the race too and it was fun to see people of all levels and abilities enjoying the triathlon. The week of the 4th was a brutal heat wave for much of the midwest and Minnesota did not escape the wrath. Training during that week was some of the hottest training I have done all year (yes, much hotter than my training in Florida this past spring). Looking back, I think that training in the heat may have helped me this past weekend. The heat and humidity began creeping up on the run portion of the race, but compared to the other week, it still felt like air conditioning to me! Okay, so now onto the race report! The race began at 7:00AM for the women and the men started 10:34 behind us! The start was a short beach run into the 81 degree water. I started out the swim conservative until I hit the first turn buoy about 400meters into the race. Once I made the first turn, I pushed the pace in an effort to separate myself from the field. The remainder of the swim, I felt strong and attempted to keep an even tempo pace. I exited the swim in first position and had a game plan to push the bike right from the start! Once I got on the bike, it was all about staying FOCUSED. I focused on pushing the pace, looking out for cracks in the road and also paying attention to the technical, narrow, windy course. I had a split just after the half-way point on the bike that I was 1:45 ahead of the second women. 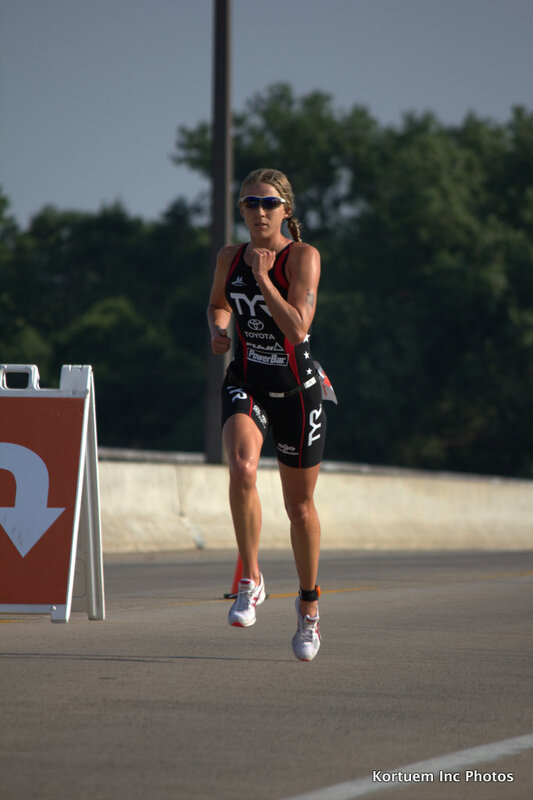 I knew that I was not just racing the women, but kept pushing on because the men were chasing fast behind me. Click here to check out my Quarq Power file on Training Peaks.com. Once out on the run, I heard of split that Cam Dye was four minutes behind me. I had a game plan of starting out the run more conservative than usual, so that I would have more in the tank at the end of the run in case it was needed. After a mile into the run, I got a split that Hunter Kemper was 5:20 behind me. Okay, I thought, this is doable. I did not get another split until after the four mile mark that I had two minutes on Hunter. I thought, “ Okay, now Sarah you need to get moving!” Hunter is such a talented runner that he can make up 30 seconds on me in the last half mile. I really began to push the pace the last mile and a half and when I hit the six mile mark, I did not see him behind me. As i came running down the shoot, the crowd suddenly started cheering much louder than normal. I took this as a sign that Hunter was beginning to close on me. I was so happy to hit that tape and sure enough, Hunter was only 75 meters behind me! The Equalizer brings another exciting element to racing for the athletes and for the fans. Hunter had an amazing race with his win as well. 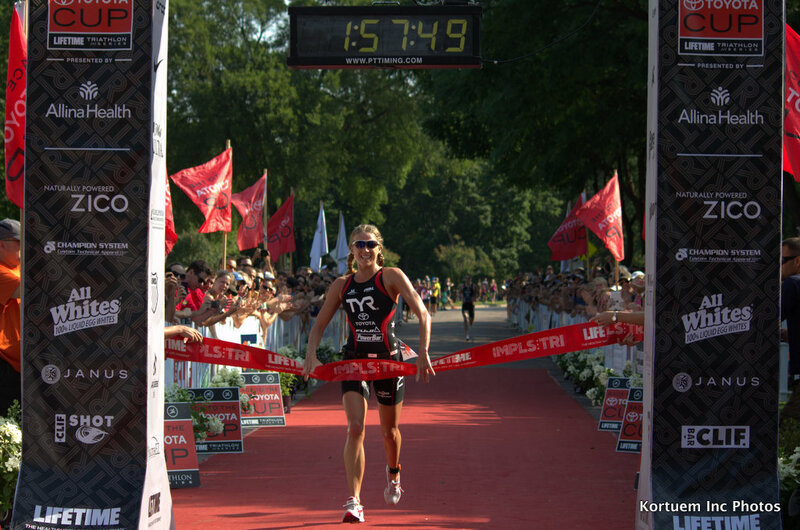 This win in Minneapolis was my fourth win in a row at this race and also a personal best by two minutes. This was the first time I have really rested and focused on this race in the middle of the season. 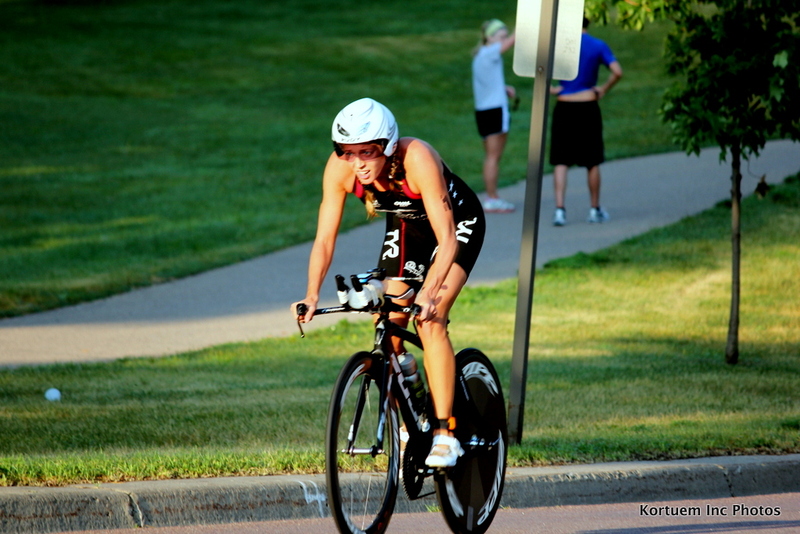 In the past I was focusing on prepping for ITU style racing and not as much on time trial riding. Although it was disappointing last May not to be able to focus on London, now I appreciate to be able to focus solely on my strength of non draft racing. This was also the 25th win in my eight year career as a Professional. I appreciate every win and can not ever take any win for granted. My effort at San Diego may have been the hardest effort of the year thus far, but I feel my performance in Minneapolis is my best yet this year. I am looking forward to the rest of the season and prepping for the key races in Des Moines and also looking to defend my Race to the Toyota Cup title. Thank you to all my sponsors who support me in wonderful ways and also to my friends and family for their support (especially when that means getting up at 5:00AM to watch me race or driving 20 hours round trip). Also thank you to my friends and family for helping me to keep perspective about my racing. 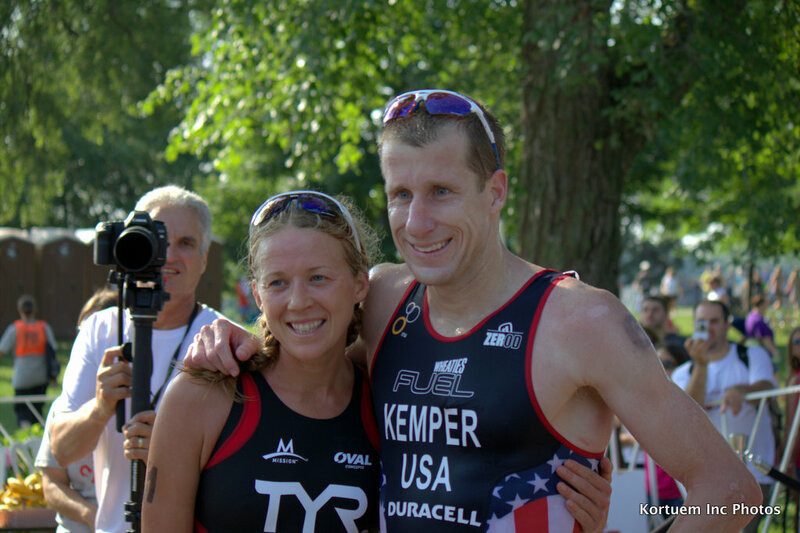 At the end of the day, no matter what happens triathlon is a chapter in the book of life. The chapter is separate, but connected in many ways. Sometimes to get the most out of one chapter, you have to read the entire book first.